Installing a privacy hedge is is a landscape design basic. Hedges provide us with privacy, a sense of safety, a helpful windbreak, a relief from neighboring eyesores, and more. In our South Florida tropical climate, we are given the gift of one of the most fantastic and unique privacy hedges to be found worldwide. It’s known to us as bamboo. Let’s explore the fabulous features of this incredible plant. Why do we love bamboo? Reason #1: It’s gorgeous. This giant grassy evergreen plant is known for it’s presence in Chinese art where it is a symbol for Oriental beauty. To the Chinese, it also represents valuable character traits like moral integrity, resistance, modesty, and loyalty. Such a deep respect by a wonderful traditional culture can only come from the real value which the bamboo plant has imparted to that culture over the centuries. Part of that value is in it’s simple beauty. The elegant, smooth, reaching canes of the bamboo plant sway gracefully in the breeze, straight and true, reaching for the sky, lining up perfectly together, creating an artistic visual display. Additionally, in South Florida, we are blessed to have access to at least 20 amazing varieties, including color variations in green, black (pictured at the top of the page), yellow, and blue, and growth habits varying from straight tall gigantic canes to thick softly arching fuller types, and even novelty variations in the cane as seen in the “Buddha Belly” bamboo below. There’s no doubt, it’s easy to become a bamboo connoisseur. 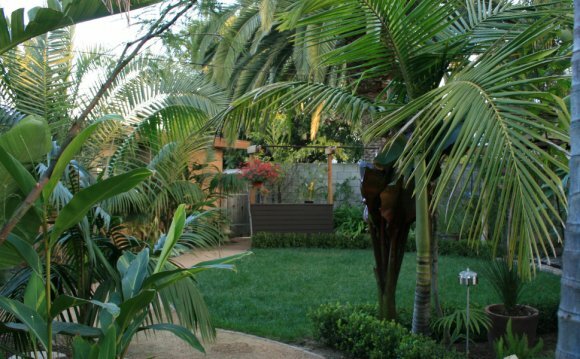 Do you long for more privacy and seclusion in your backyard? Does the openness of your outdoor space make you shrink back indoors? The Bamboo Retreat is just your style! Bamboo is perhaps the fastest growing, tallest, and smallest-footprint privacy screen or privacy hedge you can get, and our beautiful landscape designs incorporate extra undercover to create a virtual living wall so that your secret garden is deliciously all your own.